Union Pacific steel passenger cars, numbered 5601 through 9015. Length, Over Coupler Pulling Faces: 84'-6"
Length, Over End Sills: 82'-4"
Delivered in olive green paint and dulux gold lettering; most cars changed to two-tone gray in 1946, others changed to Streamliner yellow and gray in 1947. Length, Over Buffers (coupled): 85'-0"
Length, Over End Sills: 82'-7"
UP 5640; to UP 24408; to UP 904208; retired, trucks removed and placed on ground at Cheyenne, Wyoming, to serve as storage for steam program and Heritage Fleet equipment; painted brick red, with end roll-up door installed. UP 5648; to UP 24416; to UP 904216; retired, trucks removed and placed on ground at Cheyenne, Wyoming, to serve as storage for steam program and Heritage Fleet equipment; painted brick red, with end roll-up door installed. UP 5660; to UP 24428; to UP 904228; moved to North Platte Bailey Yard Visitor's Center in 2000; seen at Cheyenne on October 30, 2010 numbered as UP 5660. UP 5662; to UP 24430; to UP 904230; to UP 904826; scrapped by UP. (Previously reported in error that UP 5662 was sold to RBBB in 1999 and became RBBX 60018; RBBX 60018 has been found to be the former UP 904811, which in turn was ex UP 6301). UP 5663; to UP 24431; to UP 904231; to UP 904824; sold to Ringling Bros. in 1999, to RBBX 60016, as of October 2011, trucks removed and car stored on jack stands at RBBB rail shop at Palmetto, Florida; car moved by highway truck in 2012 to Florida Railroad Museum in Parrish, Florida (10 miles northeast of Palmetto); as of August 2012, car was being converted for use as stationary restrooms. Length, Over Coupler Pulling Faces: 73'-10"
Length, Over Buffers, Coupled: 73'-10"
UP 5715; to Alaska Railroad 5715; to Northern Rail Car in 1987; to St. Louis Car Co., remodeled to Lounge "Charrette Creek"; to RailCruise America in 2001; sold in February 2006 to KCS 1969 "Laredo". UP 5929; to UP 24455 in April 1969; to UP 904255 in January 1970; retired, trucks removed and placed on ground at Cheyenne, Wyoming, to serve as storage for steam program and Heritage Fleet equipment; painted brick red, with end roll-up door installed. UP 5730; to UP 24456 in April 1969; to UP 904256 in April 1970; retired, trucks removed and placed on ground at Cheyenne, Wyoming, to serve as storage for steam program and Heritage Fleet equipment; painted brick red, with end roll-up door installed. UP 5732; to UP 24458 in April 1969; to UP 904258 in March 1970; retired, trucks removed and placed on ground at Cheyenne, Wyoming, to serve as storage for steam program and Heritage Fleet equipment; painted brick red, with end roll-up door installed. UP 5734; to UP 24460 in April 1969; to UP 904260 in March 1970; retired, trucks removed and placed on ground at Cheyenne, Wyoming, to serve as storage for steam program and Heritage Fleet equipment; painted brick red, with end roll-up door installed. UP 5735; to UP 24461 in April 1969; to UP 904261 in April 1970; sold to Ringling Bros. in 1999, to RBBX 60019, as of October 2011, trucks removed and car stored on jack stands at RBBB rail shop at Palmetto, Florida; later in service as an elephant car until the last circus trains were operated in May 2017; to Norfolk Southern for parts (mainly the recently rebuilt six-wheel trucks). UP 5744; to UP 24469 in April 1969; to UP 904242 in December 1970; to UP 903012 in 1972; off roster; body on ground at Granite, Wyoming. UP 5778 Nov 1962 Sep 1970 33. Length, Over Buffers, Coupled: 85'-0"
UP 5755; to UP 24480 in April 1969; to UP 904280 in February 1970; sold to Ringling Bros., to RBBX 60002; to South Carolina Railroad Museum, Winnsboro, South Carolina, after the last RBBB trains were operated in May 2017. UP 5762; to UP 904290 in December 1972; to UP 904707 in October 1982; sold to Ringling Bros. in 1999, to RBBX 63009; in service as a stock car until the last circus trains were operated in May 2017; to Norfolk Southern for parts (mainly the recently rebuilt six-wheel trucks). UP 5764; to UP 904292 in December 1972; to UP 904701 in April 1981; sold to Ringling Bros., to RBBX 63004; in service as a stock car until the last circus trains were operated in May 2017; to UP and moved to Council Bluffs, Iowa. UP 5769; to UP Express 24486 in April 1969; to UP Roadway 904286 in October 1970; assigned to special service in 2000 and renumbered/renamed as UPP 5769 Council Bluffs (trucks changed from six-wheel to four-wheel), used during the 2000 U.S. political conventions. UP 5780; to UP 904823 in November 1978; first retired December 1971, reinstated May 1972; held for special service; sold to Ringling Bros., to RBBX 63013; rebuilt to power car prior to February 2011; sold to UP at auction in March 2017; after the last RBBB trains were operated in May 2017, RBBX 63013 was moved to UP at Council Bluffs and became UPP 2055; moved from Council Bluffs to Kansas City for repainting on October 24, 2017. Length, Over Coupler Pulling Faces: 84'-9"
Length, Over End Sills (End Posts): 82'-4"
Delivered in green paint scheme, with imitation gold lettering. Postal Compartment: 30'-1" inside length, with one 2'-10" door on each side. Remodeled from Baggage Postal to Postal Storage in (? ); remodeled floor plan 237-CB-24000. Photo: UP 5803, in two-tone gray paint with Overland "Baggage" lettering, at Albina, Oregon, in June 1946 in The Streamliner, Volume 4, Number 1, January 1988, page 6. Length, Over Coupler Pulling Faces: 85'-0"
Lettered as "United States Mail, Railway Post Office, Railway Express Agency"
RPO section was 60'-5"; mail storage section was 21'-6"
As of March 1950, all three cars were assigned to COSF service. Prior to retirement, all three cars were assigned to City of St. Louis service. Kansas City-Denver RPO service ended on January 28, 1967. Replaced by State of Kansas-mandated Kansas-only RPO service to Sharon Springs, the last station before Colorado, until end of all RPO service on October 12, 1967. UP 5902 was renumbered to UP 903684 in 1973; sold to Ringling Bros., in 1989, used as parts source; traded to MARC (Maryland Railroad Commuter) for parts in May 1992; refurbished and painted as MARC 199, located at Camden Yards, used as on-track storage. Length, Over End Sills: 82'-6"
Stainless steel construction, with ribbed sides and roof, and letterboards painted yellow. Mail section was 60'-9"; storage section was 21'-9"
These nine cars were UP's most modern RPO cars, having been delivered just four years before the Post Office canceled all rail-by-mail contracts in September 1967. All nine cars were donated by UP in the 1980s to the Eastern Nebraska Chapter, NRHS, which operates as the Nebraska Railroad Museum, and operates the Fremont & Elkhorn Valley Railroad (FEVR) between Fremont and Hooper, Nebraska, a distance of 17 miles; six cars leased to VIA in 1993, then sold to VIA at an unknown later date; as of 2014, all six cars were still in service as VIA 8618-8623. UP 5908; to UP 903690 in 1973; sold in 1988, displayed at the Rails West Museum, located at the former Rock Island depot in Council Bluffs, Iowa. UP 6010; built in July 1941 as part of the 10th Train (COSF); to UP ownership on December 1, 1948 when the UP-C&NW-SP joint ownership ended; renumbered to UP 6010 in May 1956 (letter for fleet renumbering dated February 27, 1956); retired by UP in April 1967; scrapped June 1968. UP 6100 was retired by UP in September 1970, and sold to R. Sperry (Los Angeles) in 1972; it was sold in 1985 to Deer Creek Scenic Railroad for operation at Heber City, Utah, but was never moved to Heber; stored at Salt Lake City, pending movement to Heber City, receiving extensive vandalism (stripped of components and interior burned); the car remained stored in Salt Lake City from 1985 until 1992-1993 when it was sold to Nevada State Railroad Museum in 1992 along with other equipment owned by Deer Ceek Scenic Railroad; moved to Boulder City, Nevada in February 1993; as of December 2016, the car was still at Boulder City, used for storage. UP 6102 was sold to C. Rasmussem "Afton Canyon" in 1972; to D. Ryan (San Bernardino); operated by Overland Rail Travel as "Afton Canyon", AMTK 800000; sold to Mexico in 1987-1989 as Servicio de Coches Dormitorios (SCD) 379 "Club Sonora"
Names removed, and cars numbered in UP 6200 series in 1956. Remodeled from Club Lounge to Lounge in 1959 by UP at Omaha, including conversion of barber shop and valet areas into card rooms. Amtrak data based on research completed by Mike Palmieri. UP 6205 was built in 1949, named "Mojave River"; changed to UP 6205 in 1956; vacated in August 1968; to H. Writers in 1969; sold to Carney's Carney's Express Limited restuarants, cut in half and moved to the Studio City location in 1975, at 12601 Ventura Boulevard. UP 6206 was built in 1949, named "Portneuf River"; changed to UP 6206 in 1956; held for special service in January 1974; sold to Mexico in 1987 as Servicio de Coches Dormitorios (SCD) 365 "Club Atoyac"
UP 6301; to UP 904811 in March 1976; retired by UP; sold to Ringling Bros. in 1999, to RBBX 60018, as of October 2011, trucks removed and car stored on jack stands at RBBB rail shop at Palmetto, Florida; cut up for scrap at Palmetto rail shop, due to fire on June 22, 2017. UP 6312; sold to Ringling Bros. in 1972, to RBBX 60006; in service as a stock car until the last circus trains were operated in May 2017; to UP and moved to Council Bluffs, Iowa. UP 6328; sold to Oliver C. Varnes of Covina, California, in 1971, operating as Overland Rail Travel Corporation (ORTC); sold to Tom Pearson (date? ); sold to Amtrak 1077 in 1977; converted to HEP 1139 in June 1981; wrecked in September 1993 at Big Bayou Canot, Alabama; listed for sale in January 1995. UP 6329; sold to Ringling Bros. in 1972, to RBBX 63002. Length, Over End Sills: 78'-11"
UP 7000-7004 were initially assigned to UP's Challenger service. UP 7005-7009 were initially assigned to UP's City of Portland service. UP 7001 was sold to Auto Train 701 in June 1972; to A. J. Daniels, Tulsa, Oklahoma in December 1981; to KCS Industries in 1982, numbered as KCS 21 (never in service, still in Auto Train colors), stored at Mid America Car, Kansas City; to Northern Rail Car; to UP (still in Auto Train colors, as UPP 7001) in October 1990, arriving at Council Bluffs on October 21, 1990; refurbished and numbered as UPP 7001 "Columbine" (2nd) between December 1991 and April 1992. UP 7002 was sold to Auto Train 702 in June 1972; to Keene Carpet, Honaker, Virginia in December 1981; passed through several private owners until sold to Virginia Rail Investment Corporation "Roanoke" (VIRX 200) in 1987; to St. Louis Car Company (SLCC) 200 in October 1989; to RailCruise America 800200, "Mark Twain Lake", renamed "Mississippi River" in 1999; sold to Kansas City Southern in January 2006 as KCS 1940 "Kansas City" (still in service as of December 2014). UP 7003 was sold to Auto Train 703 in June 1972; to James E. Strates Shows in December 1981; to Dixie Railcar; to C. P. Huntington Chapter, NRHS "Sandstone Falls" in 1982, numbered as 800377, then HUNX 7003; sold to Charter Wire, Milwaukee, Wisconsin in May 2001; in service as "Charter Club"
UP 7004 was sold to Alaska Railroad 7004, May 1972; wrecked on July 6, 1975 at Hurricane, Alaska; retired. UP 7005 was sold to Auto Train 704 in June 1972; to Anbel Corporation in 1981 (car not able to be moved), scrapped at Sanford, Florida in 1982. UP 7008 was sold to Alaska Railroad 7008 in May 1972; equipped with self-contained power equipment (HEP) in 1996 and renumbered to Alaska 501. Length, Over End Sills: 79'-2"
Initially assigned to City of St. Louis service, along with Wabash dome-coach 203, built at the same time. UP 7015 was sold to Auto Train 709 in June 1972; sold in December 1981 to A. J. Daniels, Tulsa, Oklahoma; sold to KCS Industries in 1982, numbered as KCS 22 (never in service, still in Auto Train colors), stored at Mid America Car, Kansas City; sold to Northern Rail Car; sold to UP (still in Auto Train colors) in October 1990, arriving at Council Bluffs on October 21, 1990; refurbished and numbered as UPP 7015 "Challenger". UP 8003 was sold to National Railroad Museum Green Bay, November 1971; named "Edd H. Bailey"
UP 8004 was sold to Auto Train 803 in June 1972; sold in December 1981 to Ken Nichols/Anbel Corporation, Brownsville, Texas, in December 1981, numbered as Anbel (ANBX) 2040; sold to Northern Rail Car in January 1988; in service as Scenic Rail Dining 7011 "Scenic View" (800560) in 1988-1989; sold to Transcisco Tours in October 1990 for "Sierra 49er" service, numbered as "Crystal Bay" (800560); car was repossessed after Transcisco Tour's bankruptcy and returned to Northern Rail Car in August 1991; leased to Kalamazoo Lake Shore & Chicago in August 1991 for Michigan Wine Country Dinner Train service; returned to Northern Rail Car and sold to UP in May 1993, numbered as UPP 8004 "Colorado Eagle"
UP 8005 was sold to Auto Train 804 in June 1972; wrecked in Georgia in June 1972; stored at Sanford, Florida; sold to Anbel Corporation, in 1981, car not moveable; scrapped at Sanford in 1982-1984. UP 8008 was sold to Auto Train 807 in June 1972; to A. J. Daniels, Tulsa, Oklahoma in December 1981; to KCS Industries in 1982, numbered as KCS 19 (never in service, still in Auto Train colors), stored at Mid America Car, Kansas City; sold to Northern Rail Car; sold to UP (still in Auto Train colors) in October 1990, arriving at Council Bluffs on October 21, 1990; refurbished and numbered as UPP 8008 "City of Portland". UP 8009 was sold to Auto Train 808 in June 1972; to Don Gage, Inc., Jamestown, New York, in December 1981; to Dixie Railroad Corporation, in 1982; to Frank Dowd, Charlotte, N.C., in August 1984; to Randy Schlotzhower, Los Angeles, California, in 1986, used in Domeliner Tours service as "Columbia River" (AMTK 800031), changed to "Overland Travel" and painted to match American Orient Express in 1995; changed to "Pacific Overland" and used in Rocky Mountain Daylight service; sold to St. Louis Car Company/RailCruise America in August 1999, renamed "Columbia River", used in excursion and lease service; sold to Kansas City Southern in January 2006, renamed "Monterey", assigned in December 2009 to Kansas City Southern de Mexico service, to be based in Monterery, Nuevo Laredo, Mexico. Length, Over End Sills: 79'-3"
Between February and April of 1955, the American Car & Foundry's St. Charles, Missouri plant near St. Louis completed a total of 15 (9000-9014) blunt-end observation-dome-lounge cars for the Union Pacific in Lot 4096. (Described in builder record as five bedroom-observation cars) The first five, 9000-9004, were delivered for service on the City of Los Angeles, operated over the rails of the Union Pacific and the Milwaukee Road between Los Angeles and Chicago. 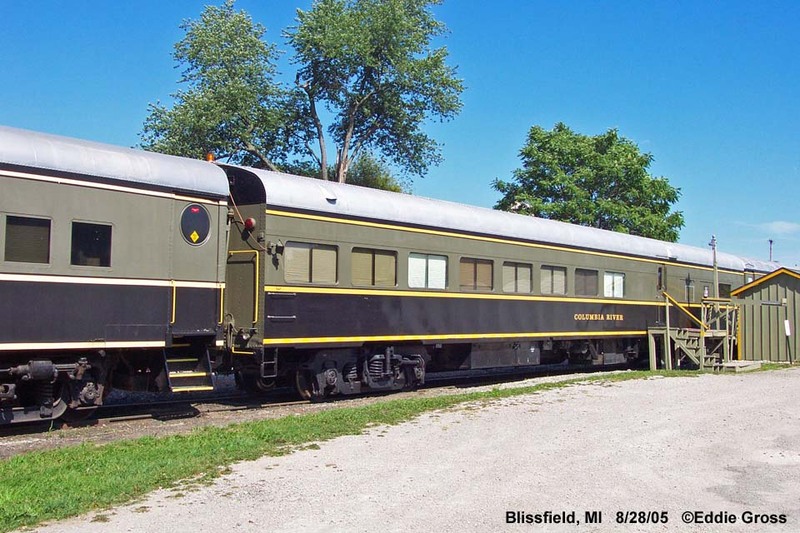 These 15 cars were delivered in 1955 as an end-of-train "Dome Observation" car. In late 1956, all 15 were pulled from service and modified to be mid-train "Dome Lounge" cars. They returned to service in November 1956, at which time all lights on the tail end had been removed. UP 9000; to Auto Train 900 in June 1972; to Robert Snow in December 1981; displayed at Orlando, Florida, as part of Mr. Snow's Church Street Station, in new dark red paint, lettered as "Rosie 'O Grady's" (ROG 300); moved to Las Vegas, Nevada during 1985 for use at Mr. Snow's Main Street Station Casino; car renamed "Orlando Dawn"; car and complex sold in 1987 to Boyd Gaming Corporation; car retains "Church Street Station" title and name and number although the casino is now called "The Main Street Casino"
UP 9001; to Auto Train 901 in June 1972; to Merle Ervin, Kanakee, Illinois in December 1981; to Itel Corporation, in January 1982, in service as Green Bay & Western 901, "Trempealeau River" (initial name, "Cross Lake" was not applied); to Fox Valley Western Railway in 1983, a division of Wisconsin Central, car retained red/white colors and number with the later addition of "Wisconsin Central" title; car remodeled in 1997 as Algoma Central (also a division of Wisconsin Central), painted silver and named "Algoma Country"
UP 9002; to Auto Train 902 in June 1972; to Delaware Otsego Corporation, in December 1981, in service as New York, Susquehanna & Western 902; remodeled in 1982-1984 as a theater car complete with full end glass window, renumbered 509; became a CSX asset in 1999 (thru CSX ownership of Delaware Otsego Corporation). UP 9014; to Auto Train 913, February 1969, wrecked during 1975; sold sight unseen to Ted Bywater, Orlando, Florida, in December 1981, upon inspection, the car was found to be in very poor shape and was sold; new buyer stripped what was wanted out of the car and left it in worse shape, unable to be moved from the former Auto Train site at Sanford, Florida; sold to a metal salvage company in Sarasota, Florida, and scrapped on site. Converted to mid train service in 1959. UP 9015 was built in May 1947 as "Moon Glow", part of General Motors' Train of Tomorrow; entire train sold to UP in April 1950; "Moon Glow" name removed and car numbered as UP 9015 in March 1956; retired in November 1964; sold to scrap yard in Pocatello Idaho in March 1965; "discovered" during 1990, and purchased by the Golden Spike Railroad and Locomotive Historical Society for display by The Ogden Union Station Foundation. Car is currently stored off-site for possible restoration and display at their museum.